The Roman emperor Maxentius (right) abducted St Catherine of Alexandria (left) and ordered philosophers to convert her to paganism. When they failed and became Christians themselves, Maxentius had them burnt to death. With his crown, sword, beard and robes, the emperor resembles a medieval king. This makes him an easily recognised symbol of power. The sides of the panel at the top have a plain narrow border. The crowned saint, wearing a cloak over her gown, stands on the left of the panel, facing the Emperor Maxentius. With her left hand she gestures to the heads of seven philosophers, wearing stalked caps, who are being burnt. The fire is indicated by pieces of logs, or sticks, and flames. In the centre of the panel an executioner, wearing a flat cap, doublet and belt, pushes the head of one philosopher into the flames with a large fork. The emperor is bearded and crowned and wears a cloak and tippet over his gown. A devil (broken) emerges from the crown, indicative of evil. The emperor gestures to the philosophers with his right hand; in his left he holds a sword, which he rests against his shoulder. At his feet a second executioner, wearing doublet and belt, fans the flames with bellows. At the top, below the canopy, which is an integral part of the panel, two angels bear seven diminutive heads in a napkin, representing the souls of the philosophers. The top of the panel is damaged; part of the architectural canopy has been broken off. The emperor's right hand, the hilt of his sword and the left hand of the standing executioner have been repaired with plaster. The emperor's sword and the top of his crown are broken. The left leg of the executioner with the bellows is missing. The right hand of the standing executioner and the top of his fork are missing. Green paint remains on the ground, with the usual daisy pattern. The emperor and the two executioners have darkened faces, symbolizing their evil character. Traces of gilding and small gesso bosses remain on the upper background of the panel. There is brownish paint on the flames of the fire. Red colouring remains on the inside of the emperor's cloak and under the architectural canopy. The bright yellow paint on the emperor's right hand, on the standing executioner's left hand and on the hilt of the emperor's sword looks modern, and is applied to plaster restorations. The top of the back of the panel is strengthened with slate. There is one lead-plugged hole. The bottom has been cut away. There are two sorts of alabaster. Calcite alabaster is very hard and was used in ancient times. This object is made of gypsum alabaster which is a fine-grained, soft and smooth stone. Although at first glance it looks a little like marble, which it was intended to imitate, it was much easier to carve due to its softness, and alabaster objects were therefore significantly cheaper to produce. Marble does not originate in England, so it was imported if needed. 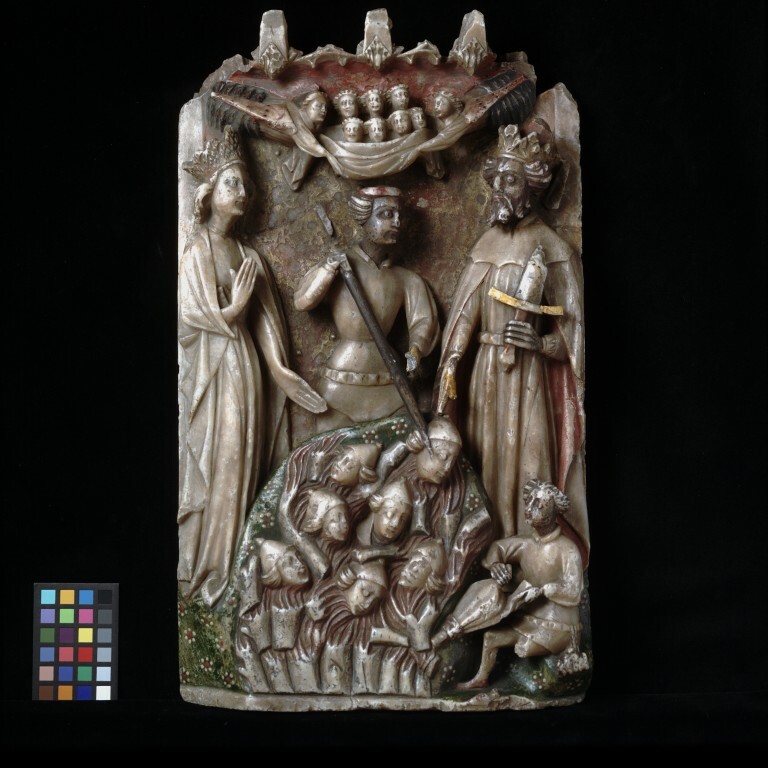 The carving of alabaster, mostly quarried in Tutbury and Chellaston near Nottingham, took on industrial proportions in England between the middle of the 14th and the early 16th centuries. The market for altarpieces and smaller devotional images was a large one. It included not only religious foundations but also the merchant classes. Many hundreds of English alabasters were exported, some as far afield as Iceland and Santiago de Compostela in north-west Spain. The sides of the panel at the top have a plain narrow border. The crowned saint, wearing a cloak over her gown, stands on the left of the panel, facing the Emperor Maxentius. With her left hand she gestures to the heads of seven philosophers, wearing stalked caps, who are being burnt. The fire is indicated by pieces of logs, or sticks, and flames. In the centre of the panel an executioner, wearing a flat cap, doublet and belt, pushes the head of one philosopher into the flames with a large fork. The emperor is bearded and crowned and wears a cloak and tippet over his gown. A devil (broken) emerges from the crown, indicative of evil. The emperor gestures to the philsophers with his right hand; in his left he holds a sword, which he rests against his shoulder. At his feet a second executioner, wearing doublet and belt, fans the flames with bellows. At the top, below the canopy, which is an integral part of the panel, two angels bear seven diminutive heads in a napkin, representing the souls of the philosophers. Acquired by P. Nelson in Copenhagen. In the possession of Dr W.L. Hildburgh and on loan to the Museum from 1926. Given by Dr W. L. Hildburgh, 1946.